Increasing the data record length, denoted Nr in this case study, improves spectral resolution, but the decay rate of the spectral leakage still needs to be addressed. Many window choices are available in common signal processing tool sets. The SciPy signal package is no exception. To get to the point, the figure provides plots of for some popular windows. 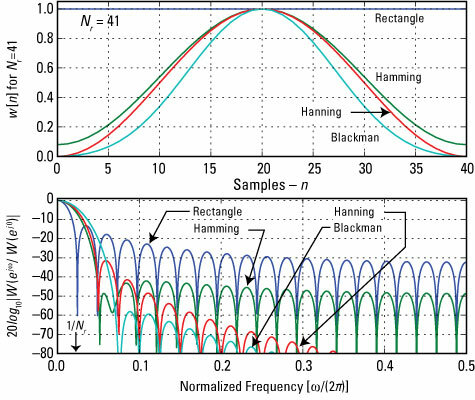 The frequency response is the most informative with regard to spectral analysis. Attributes of interest include full width of the main lobe as a multiple of fs / Nr, the highest side lobe in dB, and the rate of side lobe falloff in dB/octave. The following table summarizes these attributes for the four windows considered in the figure. Low side lobes generally mean that a wide main lobe exists. The –18 dB/octave falloff rate is nice, but it comes at a price: a main lobe width of 6.2. The falloff rate and relatively narrow main lobe of the Hanning window are good. The rectangle has the narrowest main lobe of all windows but poor side lobe level and falloff rate.